It’s hard to decide what to keep, what to donate, and what to put into storage when you’re in the throes of attempting to reorganize your home. Sometimes we get a little too sentimental, sometimes we get overwhelmed by how much there is to do, but whatever problem pops up they all lead to the same thing: organization not getting done. Organized homes make us feel better and more in control, which is why we’ve put together these four questions to ask yourself when you’re trying to decide what to keep out and what to put away. After all, who doesn’t want to feel more comfortable in the place they live? Do I even use this? I know that this seems like an easy question to answer, but a lot of times we keep things sitting around even though we aren’t actively using them just in case. If you haven’t used an item sitting out in your home in more than six months, it might be time to ask if it should be there at all. 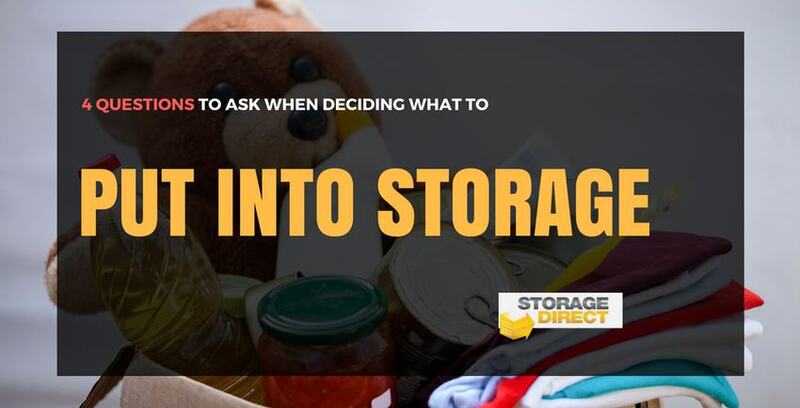 We aren’t saying you have to toss it out – in fact, renting a storage unit is a great way to hold onto the things you value while keeping your home organized – but we do recommend being more aware of the things in your home and whether or not they’re being used. Some things just aren’t used year round – and that’s okay! This rule doesn’t only apply to clothing, either, in fact there are a large number of items only used during certain times of the year that could be taking up unnecessary space in your home right now. For example: camping equipment, beach towels, and picnic items are only used in summertime and can be stored during winter. Alternatively coats, skis, ice skates, and other items are only used during the cold months and can be stored during summer. Don’t even get us started on holiday decorations! Could I be doing more to keep sentimental items safe? Memories and mementos are important, and protecting them is as well, but sometimes we can get overwhelmed by the half a dozen boxes of old photographs taking up valuable closet space. To avoid throwing out something you’d regret losing in an emotional cleaning frenzy (everybody has them), put them somewhere where they’ll be safe and secure. That way, when you revisit them, it won’t be with annoyance but instead appreciation for the value they hold. Win-win! Does it have a use-by date? If so, has it past? While the main focus of this blog is about storing unused items for a later date, there are some things that will inevitably need to be thrown out during this process. Things other than food have expiration dates, but the average person isn’t always aware of this detail. For instance, the shelf life of mascara is only three months. It’s a small, dark tube – otherwise known as a perfect breeding ground for icky and potentially harmful bacteria. Other varieties of makeup have longer shelf lives but none of them are going to be more than a year or two. Many over the counter medicines have expiration dates as well. It might be time to replace that bottle of Tylenol that you’ve had since college. Once you’ve gone through your stuff and used these questions to more easily determine what deserves to stay out and what needs to be stored away, you’ll be on your way to total home zen. If you want to thank Storage Direct for the help, well… it’s all in a day’s work!